Can you hear it? That certain hum? It’s on the streets of one particular bohemian city just outside Orlando. It’s a beat so distinct it permeates the very core of your soul. And on any given day that’s precisely what you’ll encounter. That rhythm. A kind of impromptu melody, that sings within the hearts of visitors and locals alike. Though it’s not audible to most, it’s there. It is. Look closely and you’ll see it for yourself, in the syncopated footsteps, overt skips, and even the over-zealously playful nature of the people strolling down an avenue called Park in a city named Winter Park. This colorful corridor has a style all its own: walkways dotted with sassy shops and cozy cafes, and in the air, the most heavenly, delectable scents. Rich, dark, robust aromas waft over the crowded, art inspired streets making one wonder if it’s the coffee, the international cuisine, or the best nourishment of all: food for thought. 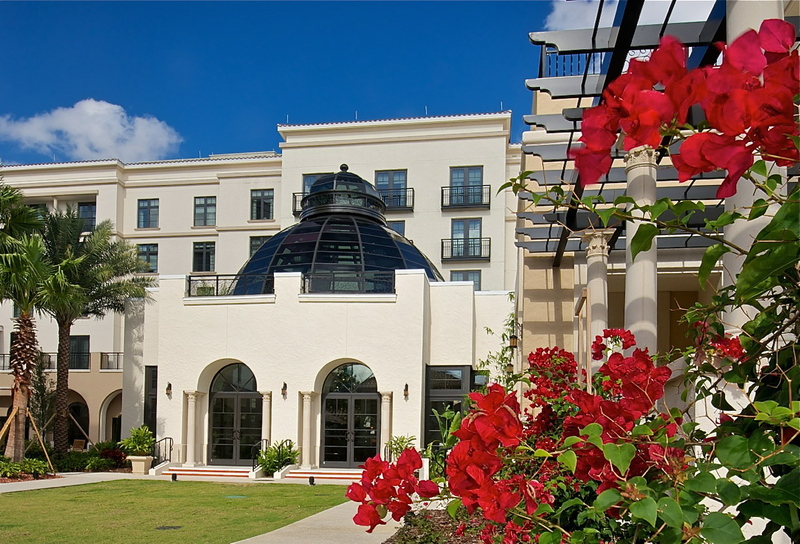 Gorgeous grounds and dramatic architecture welcome guests to The Alfond Inn. Image Credit © Dale Sanders 2014. Clean lines, soaring windows, and angular shapes mark the entrance to one of the most thoughtful structures to make its debut in this creative city: The Alfond Inn. Part hotel, part art gallery, this 112-room boutique property boasts an elevated pool, award-winning cuisine, lush gardens, and a roaring outdoor fire pit. 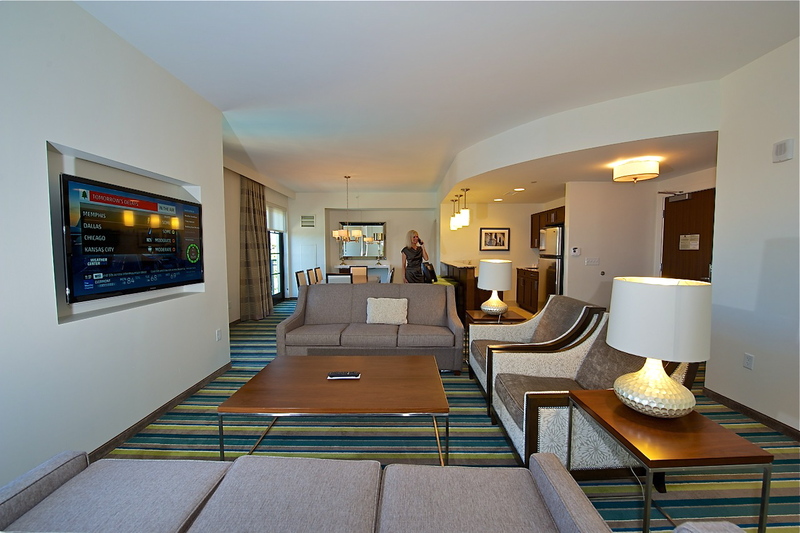 The hotel has received rave reviews since opening its doors last fall, and for good reason. At the center of this “holistic style” hotel is its mission of giving back to the very community it serves, which unlike most, is both rare and noble. 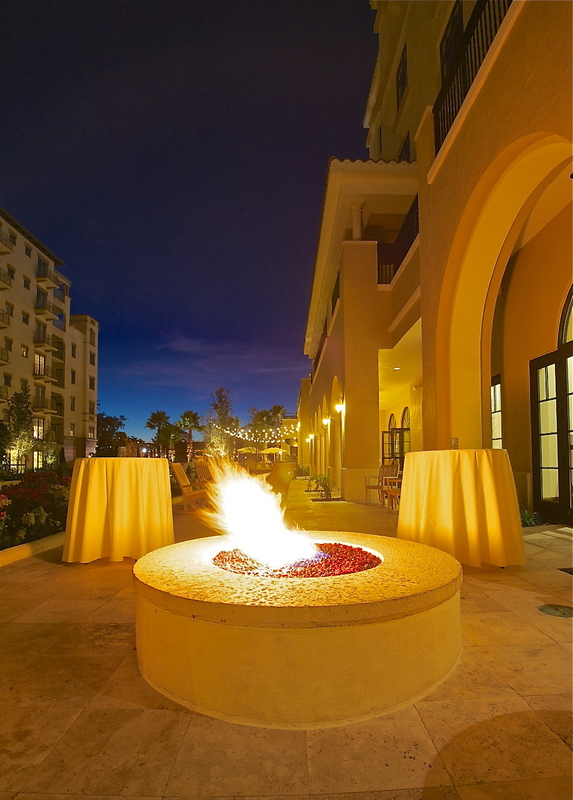 A roaring fire pit that warms your hands and heart at The Alfond Inn. Image Credit © Dale Sanders 2014. Architecture becomes its own form of art at The Alfond Inn. Image Credit © Dale Sanders 2014. 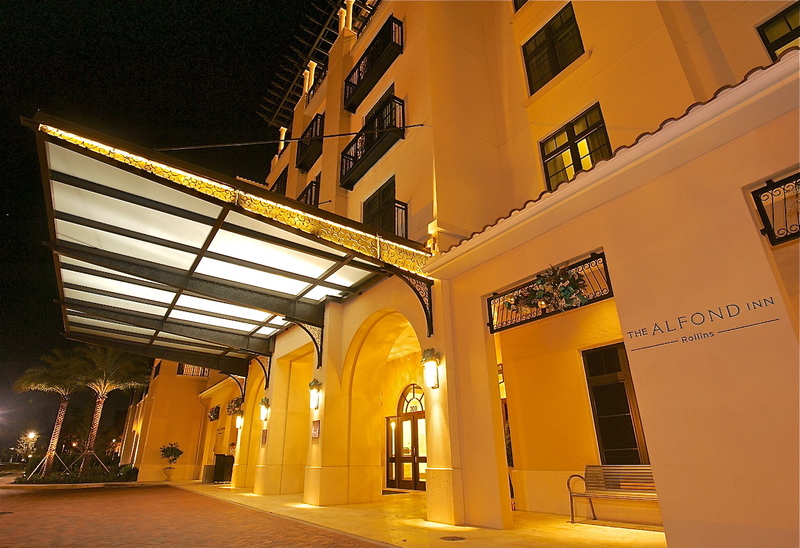 Owned by Rollins College, The Alfond Inn was designed and constructed with a $12.5-million grant from the Harold Alfond Foundation. This philanthropic mantra of “giving back” rings true in what’s done with the net operating income from the Inn; it’s directed to a scholarship endowment fund to help students pursuing their educational dreams. Full scholarships and ample financial assistance are awarded to a number of deserving students from this hotel’s proceeds. 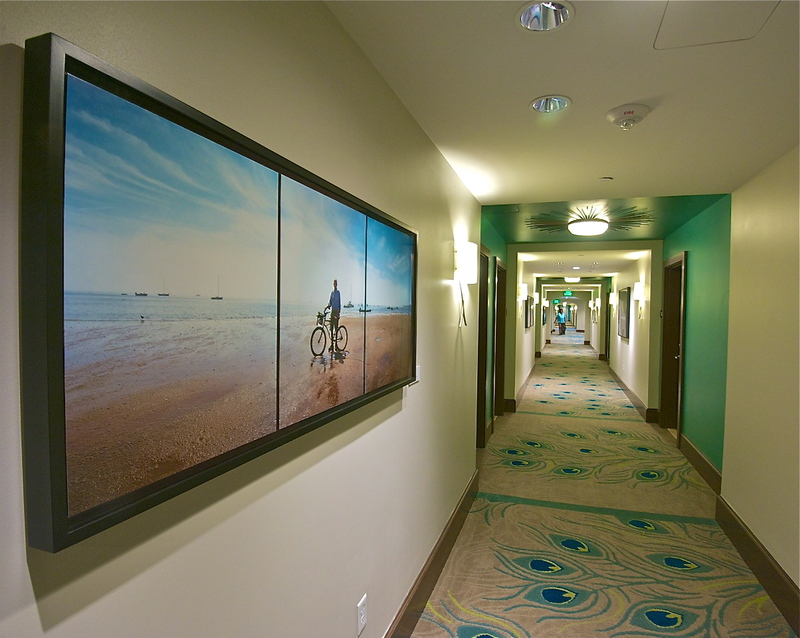 And whether or not they know it, guests are also receiving their own education — in art — as paintings, sculptures, photos and artistic creations greet them in the hallways, walkways and public spaces of the hotel. 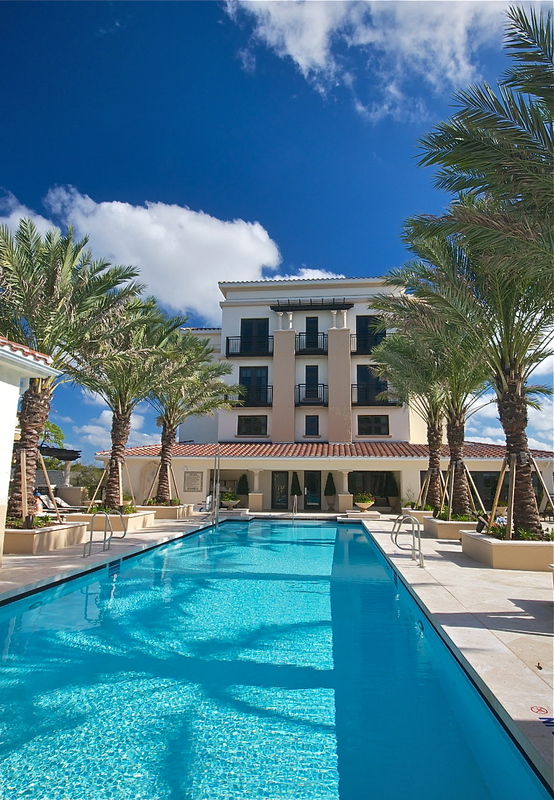 A palatial rooftop pool beckons guests to take a dip at The Alfond Inn. Image Credit © Dale Sanders 2014. 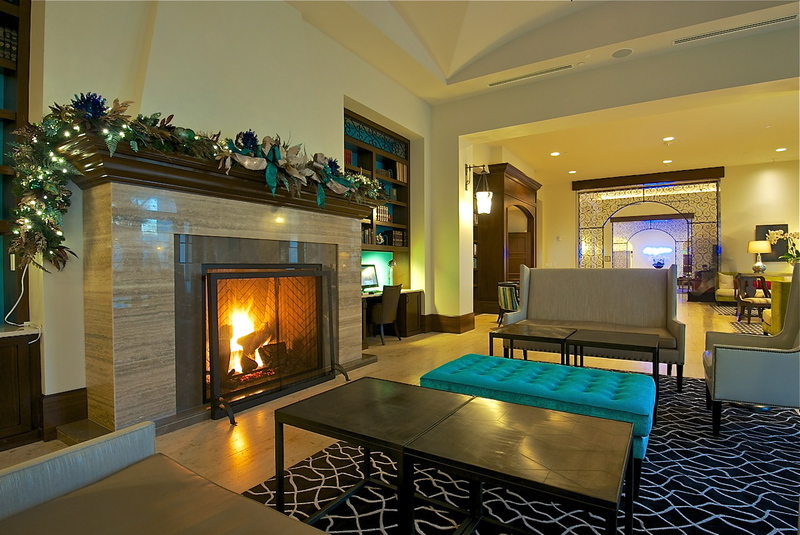 Warm and inviting interiors envelop your senses at The Alfond Inn. Image Credit © Dale Sanders 2014. 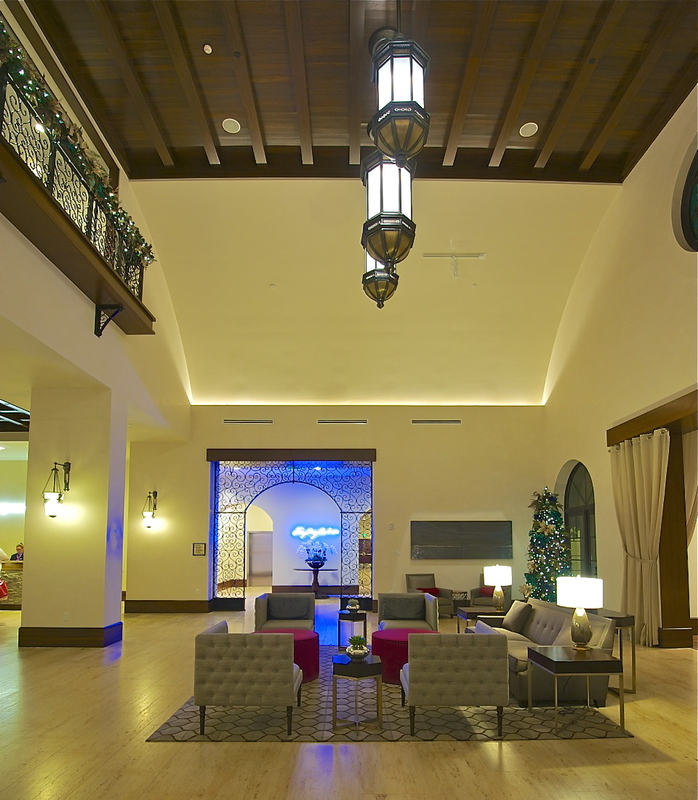 Sleek, chic and oh so mod raises the guest experience to new heights at The Alfond Inn. Image Credit © Dale Sanders 2014. Guided tours of the collection, never before on view publically, are offered daily at 10 am and 2 pm by a Concierge trained by Barbara Alfond and Dr. Ena Heller, the Bruce A. Beal director of the Cornell Fine Arts Museum at Rollins College. The tour is free but reservations are requested. Modern comfort with views to match at The Alfond Inn.Image Credit © Dale Sanders 2014. Frequent guests will also see that the collection changes every few months, with a hands-on rotation by Barbara Alfond and curator Abigail Ross Goodman. Amazing art graces the spaces at The Alfond Inn. Image Credit © Dale Sanders 2014. 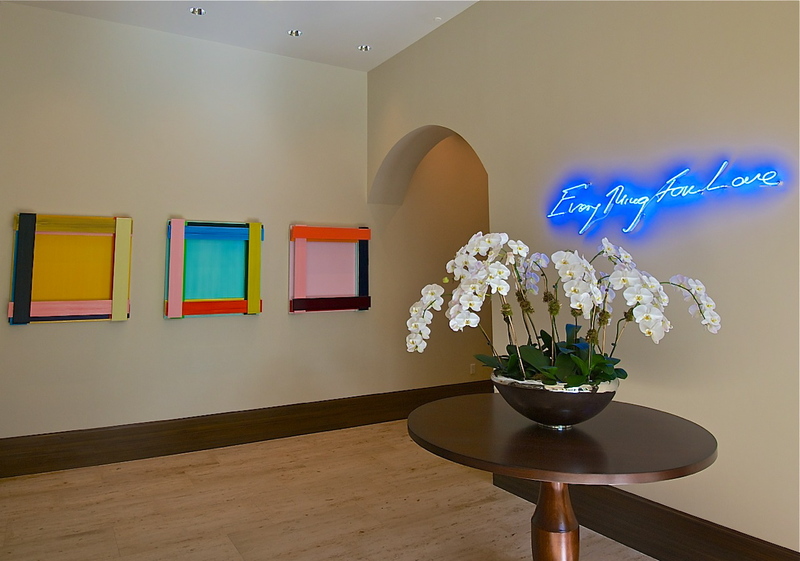 Endearing works of art greet guests in The Alfond Inn’s lobby. Image Credit © Dale Sanders 2014. 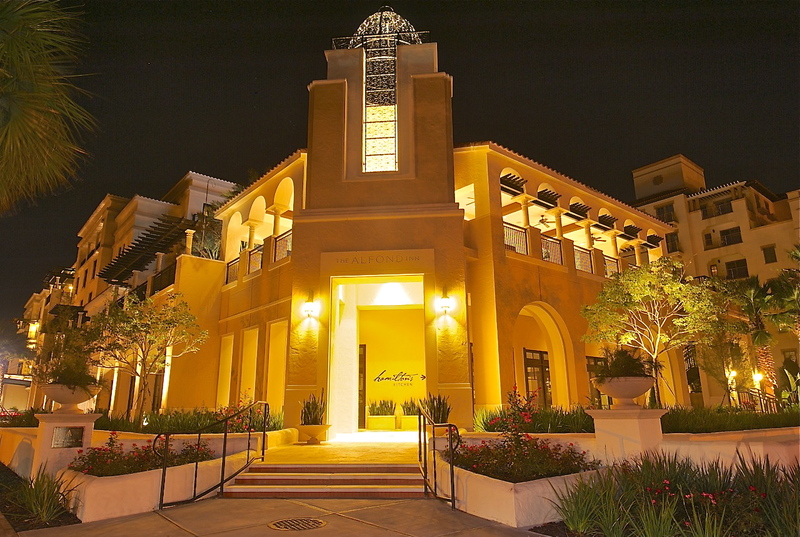 Warm, soft glows surround The Alfond Inn when night falls. Image Credit © Dale Sanders 2014. 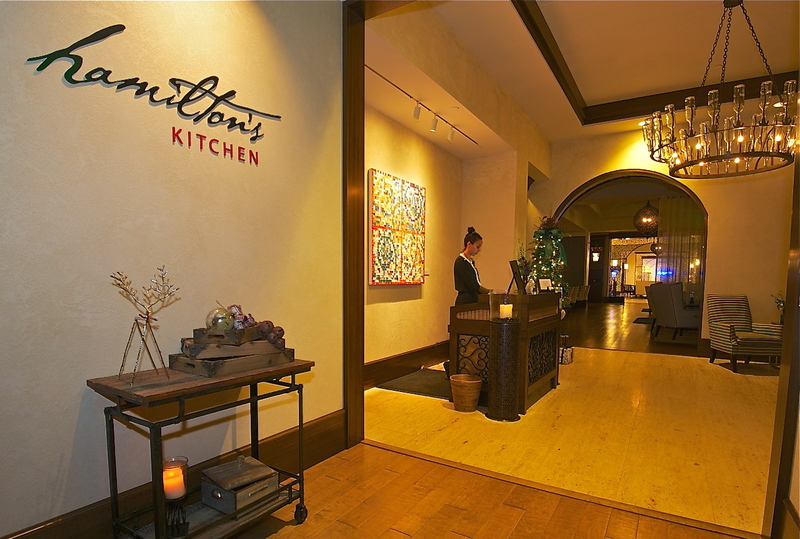 A grand entrance sets the stage for what’s to come at Hamilton’s Kitchen. Image Credit © Dale Sanders 2014. 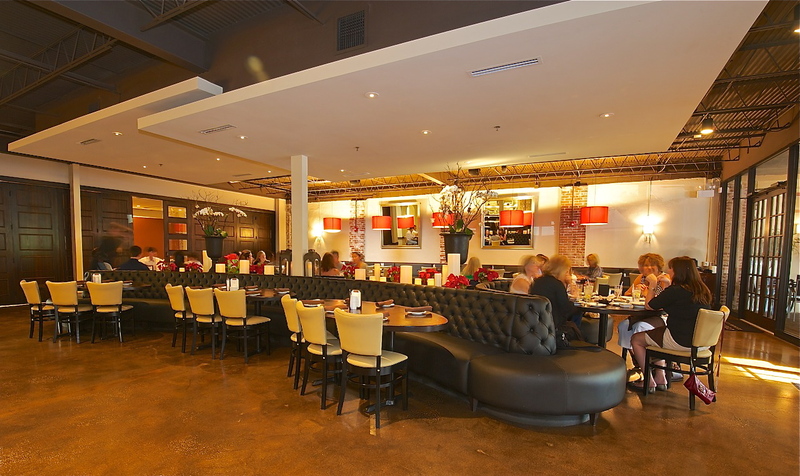 Eclectic chairs round out each table at Hamilton’s Kitchen. Image Credit © Dale Sanders 2014. 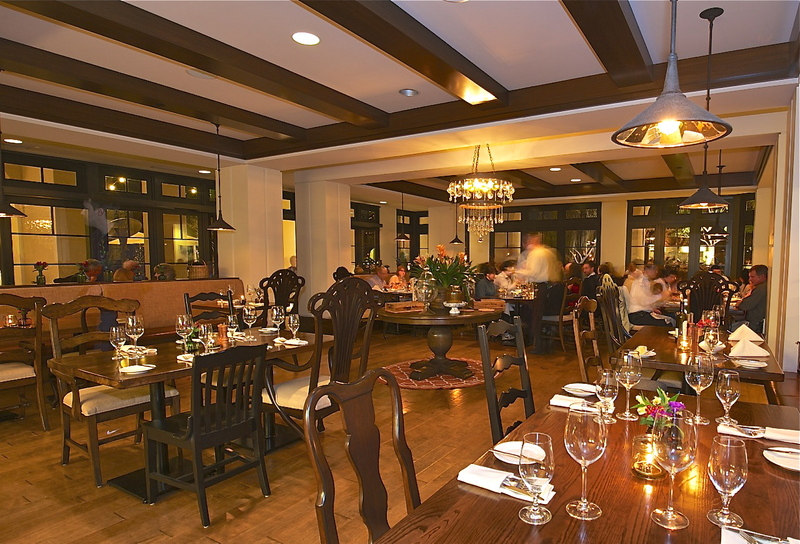 The thought process kicks into high gear upon entering Hamilton’s Kitchen, the signature restaurant at the Alfond Inn. Named after the seventh president at Rollin’s College, the eatery embodies that same spirit of ingenuity and generosity the college is known for. Certain touches put in place on purpose demand your attention. Chairs of different shapes and styles surround each table. Candles, infused with olive oil and garlic clove, flicker warmly upon distressed dark wood surfaces. And the cuisine, the mouthwatering, flavorful, creatively constructed cuisine, is both revered and celebrated. An impressive wine list sets the mood at Hamilton’s Kitchen. Image Credit © Dale Sanders 2014. 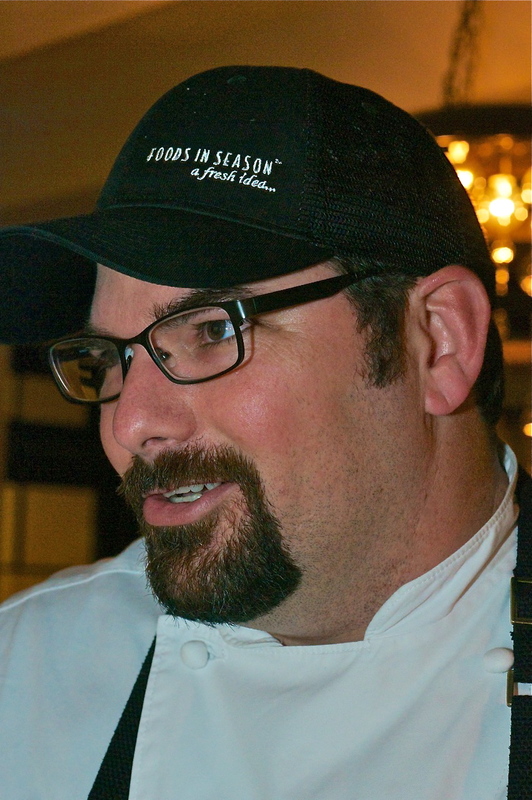 Award-winning creations come to life courtesy of J. Christopher Windus, executive chef at Hamilton’s Kitchen. Image Credit © Dale Sanders 2014. Traditional, Southern cooking intersects with modern day preparation in this spacious, open style kitchen. Dishes infused with citrus, strawberries, corn, tomatoes, beef and fresh seafood from the Gulf of Mexico pay homage the rich history of local agriculture. Produce from a variety of vendors at the farmers market that’s just up the street, are thoughtfully incorporated into the kitchen’s nightly recipes. The culinary team here is deliberate about food and fiercely loyal to the folks who grow the very ingredients they use. It’s their passion. Cooking, to them, has always been a sort of refuge, a place to create and express. Like two beautifully built bookends, meals are approached with a comprehensive theme. 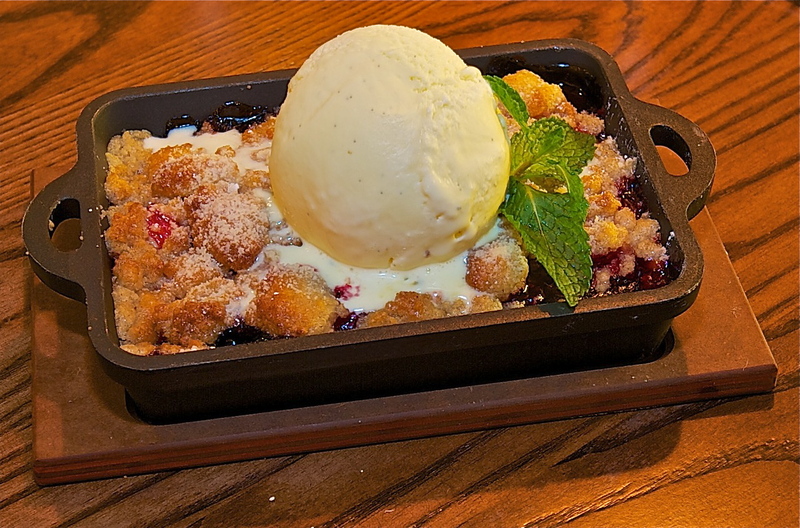 Appetizers like the deconstructed oysters Rockefeller tantalize taste buds, while endings like the warm, mixed berry cobbler, topped with vanilla bean ice cream melt hearts. Bite into sheer nirvana at Hamilton’s Kitchen. Image Credit © Dale Sanders 2014. 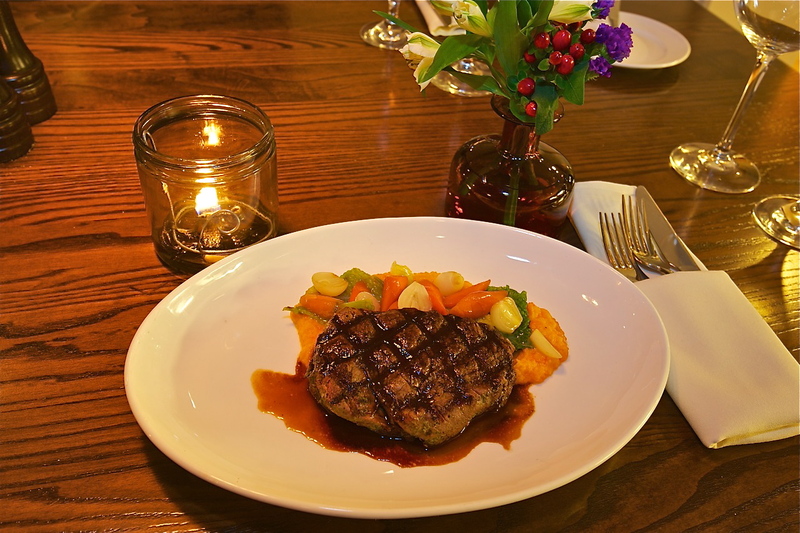 From the rustic farmers tables, to the heavy serving pieces, to the warm, inviting staff, the commitment to serving locally sourced ingredients shines through in each dish. Call it informal dining with a dash of formality. Whatever it is, it keeps diners coming back again and again to experience that certain something that seems to be missing at many cookie-cutter type establishments. Soulful artistry springs eternal here. Dessert that’s worth every calorie at Hamilton’s Kitchen. Image Credit © Dale Sanders 2014. One of the best ways to get the lay of the land in Winter Park isn’t by walking, biking or even driving. Located just five minutes from trendy Park Avenue is one of the most breathtaking views you’ll ever find, and this ride is all about relaxation. Swaying palms, lush landscapes, exquisite estates, magnificent mansions and that’s just the first 20 minutes of your journey along Lake Osceola. Welcome to the Winter Park Scenic Boat Tour. This hour-long, 18-passenger pontoon boat ride won’t disappoint. What it will do is provide a rich history of this cozy community, and leave you yearning to explore it. 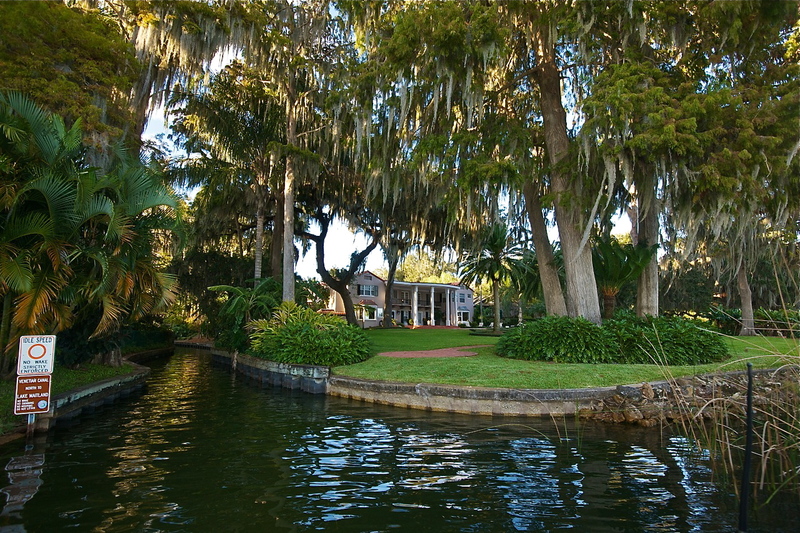 Spend an afternoon gliding through paradise on the Winter Park Scenic Boat Tour. Image Credit © Dale Sanders 2014. 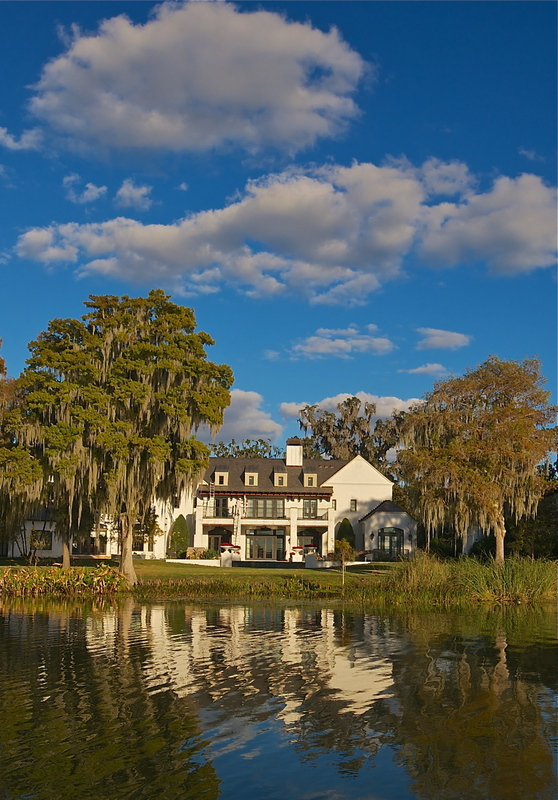 Magnificent mansions are just one of the highlights of Winter Park’s Scenic Boat Tour. Image Credit © Dale Sanders 2014. 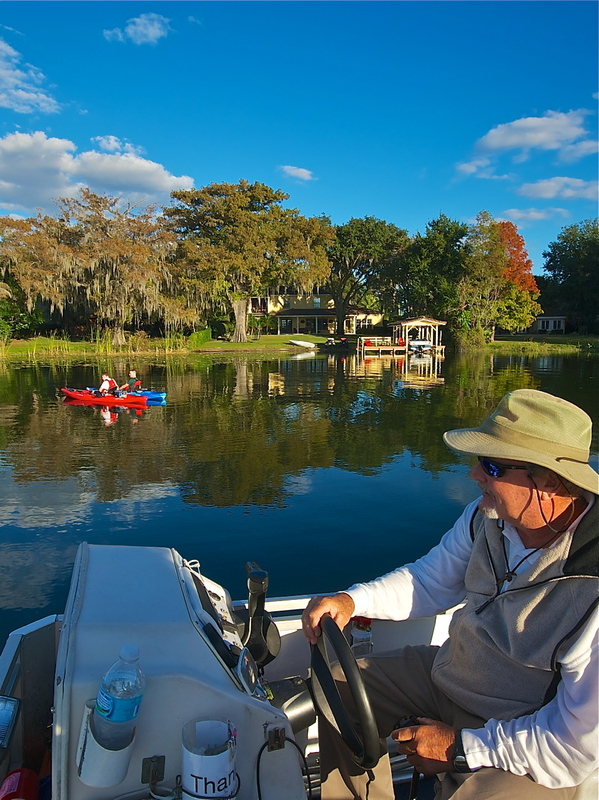 Guided cruises take visitors through three of the seven lakes and two, narrow man-made canals on the tranquil Winter Park chain. Each ride features towering cypress tress, sub-tropical flowers, and that perfect piece of serenity we’re all in search of. Open 364 days a year, this popular attraction is the furthest thing from a tourist trap. In fact, I’d consider it a museum on water. The historic homes, lush ferns, and curious birds are the ultimate works of art. 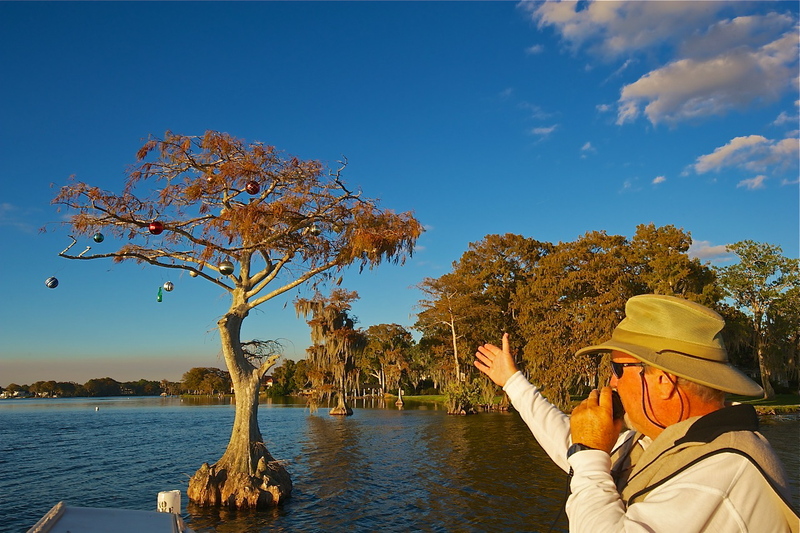 Get up close with nature on Winter Park’s Scenic Boat Tour. Image Credit © Dale Sanders 2014. Lush landscapes await you on Winter Park’s Scenic Boat Tour. Image Credit © Dale Sanders 2014. Slip on your favorite pair of shoes for this stroll. And make sure they’re comfortable. Taking this trek is a no-brainer. Block after block of sheer, unabashed bliss awaits eager shoppers, diners, and those “just looking” for that perfect place to plop down and people watch. 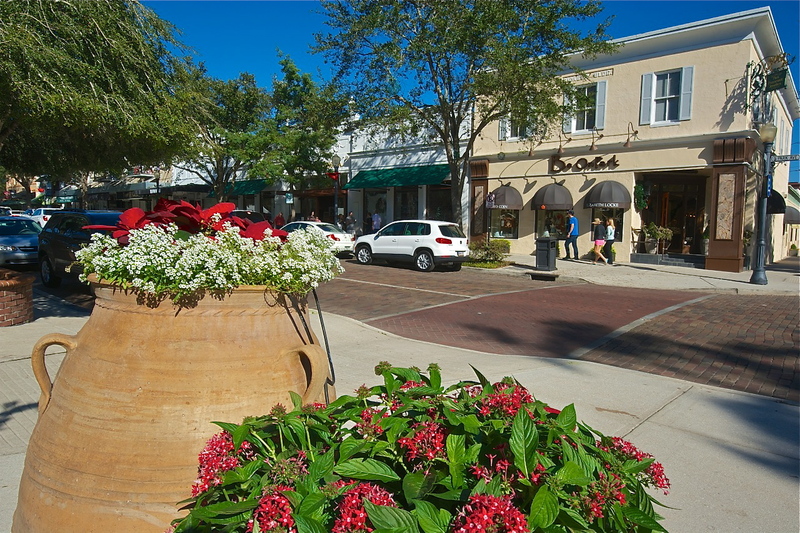 Park Avenue is Winter Park’s version of Rodeo Drive, without all the hoopla. The vibe here is, “I’m trendy, not flashy.” Sidewalks become real life billboards for nirvana. To the right, wine bars and coffee shops. Across the street, unique accessories, fashionable favorites, and a nationally known museum. Shoppers and diners delight on Winter Park’s popular Park Avenue. Image Credit © Dale Sanders 2014. As the sun begins to shift, I quickly realize time is slipping away and my need to explore the Morse Museum is outweighing all other options for the moment. 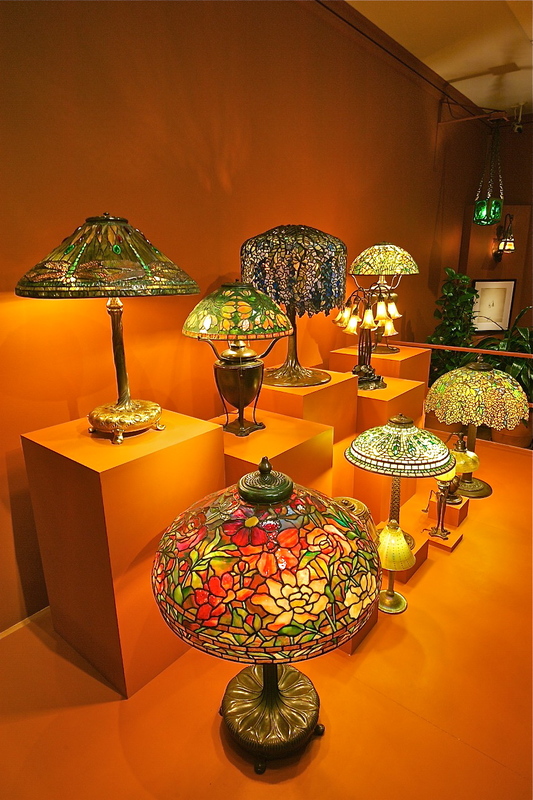 Glorious glass creations draw in the crowds at the Morse Museum. Image Credit © Dale Sanders 2014. 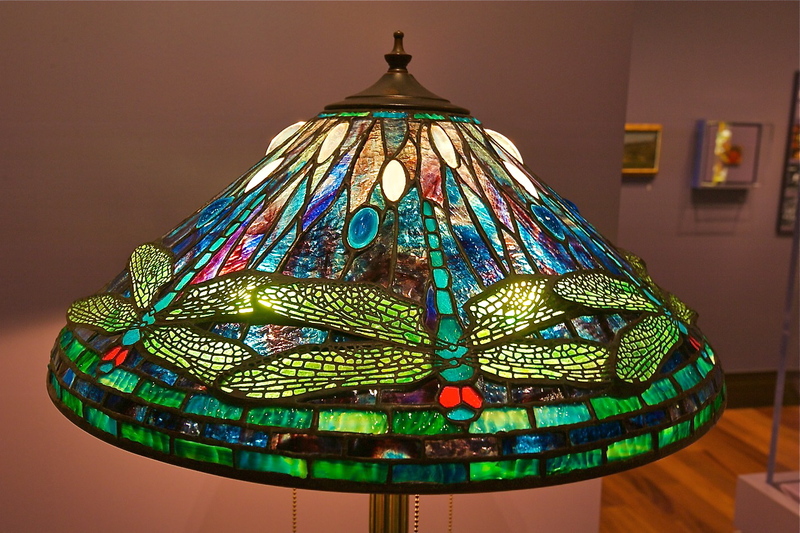 The Morse Museum boasts the most comprehensive collection of Tiffany creations anywhere. Image Credit © Dale Sanders 2014. Just a few blocks away from the Museum, is an establishment also dedicated to the celebration of glass, or shall we say glasses. Beautiful, dainty, long-stemmed wine glasses may never make their way into any museum, but that won’t matter to the steady stream of locals and gaggles of visitors who keep this place brimming excitement nearly every night of the week. 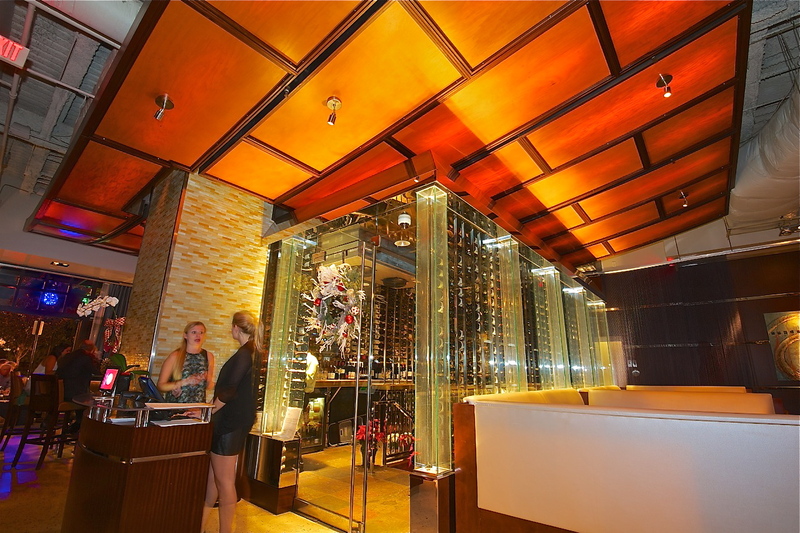 The Wine Room showcases over 156 hand-selected wines that can be sampled by 1oz, 2.5oz or 5oz pour sizes on new state-of-the-art Enomatic wine dispensing machines. All wines are available to purchase. 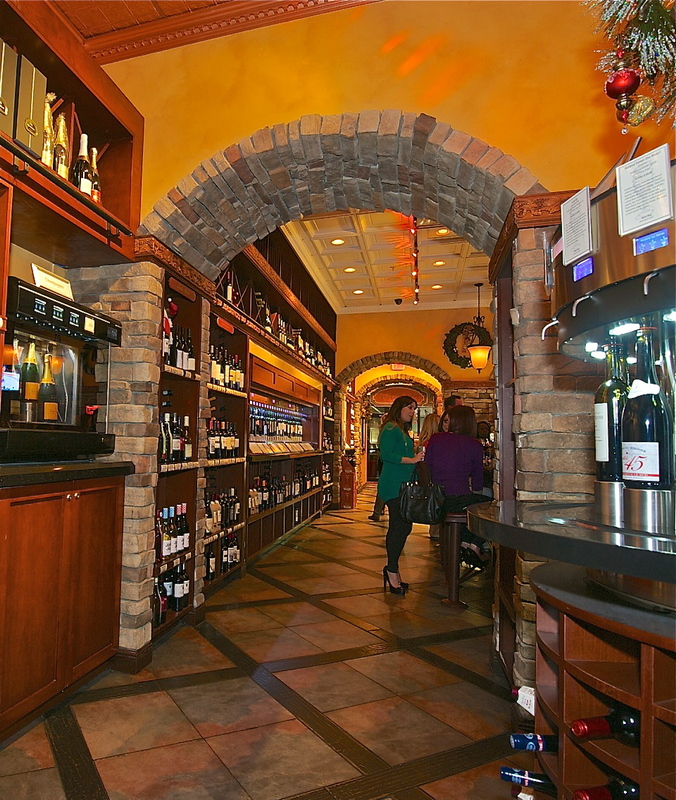 More than 156 hand-selected wines await your palate at The Wine Room. Image Credit © Dale Sanders 2014. Grab a seat inside the Chateau-styled interior, or venture downstairs to the vault to relax in a lounge-type atmosphere. If people watching are your ultimate goal, then let your thoughts take flight in the outdoor seating area. Select from an assortment of charcuterie trays complete with artisan meats and cheeses, pickled vegetables, and grain mustards. A new tapas-style menu features Mimosas and Champagnes as well as ice-cold microbrew or draft beer from the bar. 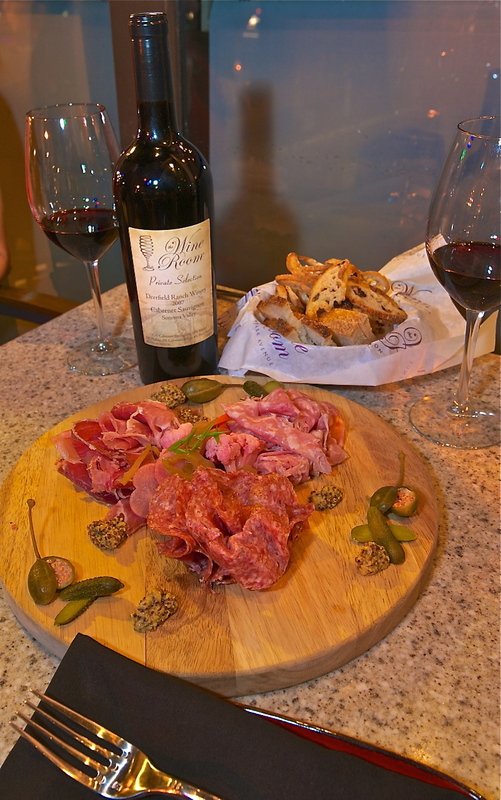 Charcuterie paired with the best selection of reserves at The Wine Room. Image Credit © Dale Sanders 2014. Bruce Simberg. Image Credit © Dale Sanders 2014. 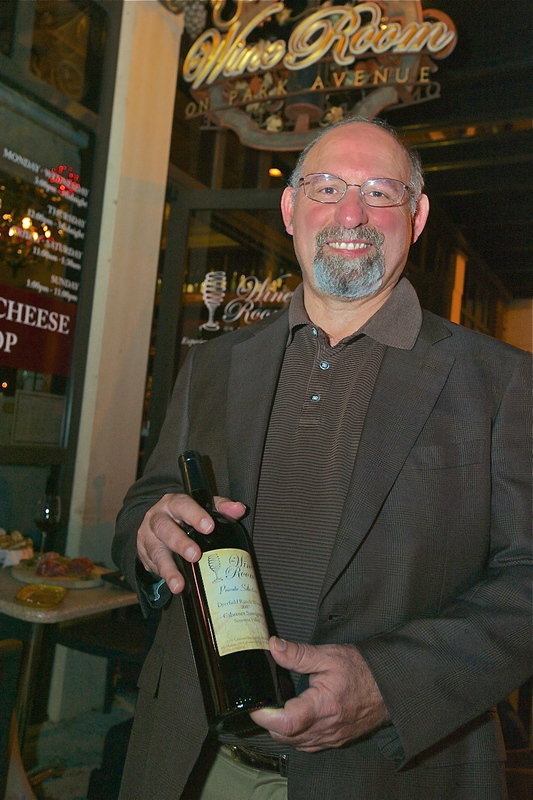 What once began as the private wine collection of owner Bruce Simberg has now become the winner of the “Best of Award of Excellence” from the Wine Spectator. Finding a great place to eat in Winter Park isn’t easy. After all, there are serious factors to consider. And depending on which type of cuisine strikes your fancy, you could find yourself in a real predicament. Which wildly popular restaurant should you try tonight? With scores of them serving up stellar tasting dishes, this decision may require a real thought process to ensue which in turn, could work up a real appetite. 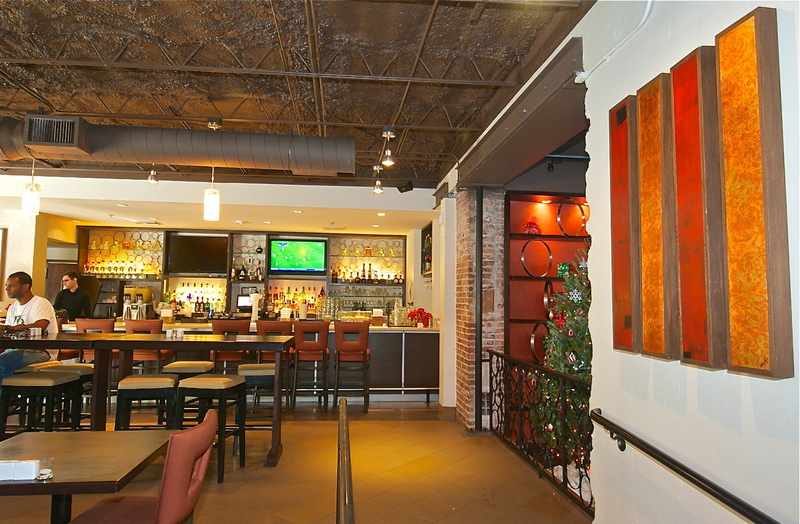 Impressive décor greets diners at Cocina 214 Restaurant & Bar. Image Credit © Dale Sanders 2014. 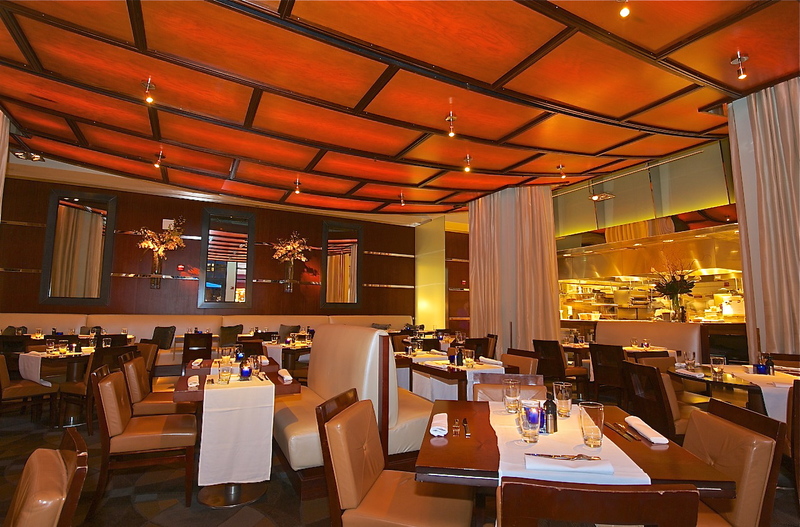 Bold flavors served in a vibrant, elegant setting at Cocina 214 Restaurant & Bar. Image Credit © Dale Sanders 2014. Mexican merges with modern magnificence at Cocina 214 where bold favors collide with fresh, authentic recipes in an elegant, ultra-hip setting. This contemporary Mexican kitchen and bar was created when two of the owners from Texas missed the Tex-Mex and Mexican food they had grown up eating. They wanted the same authentic, fresh and quality food here in Winter Park. 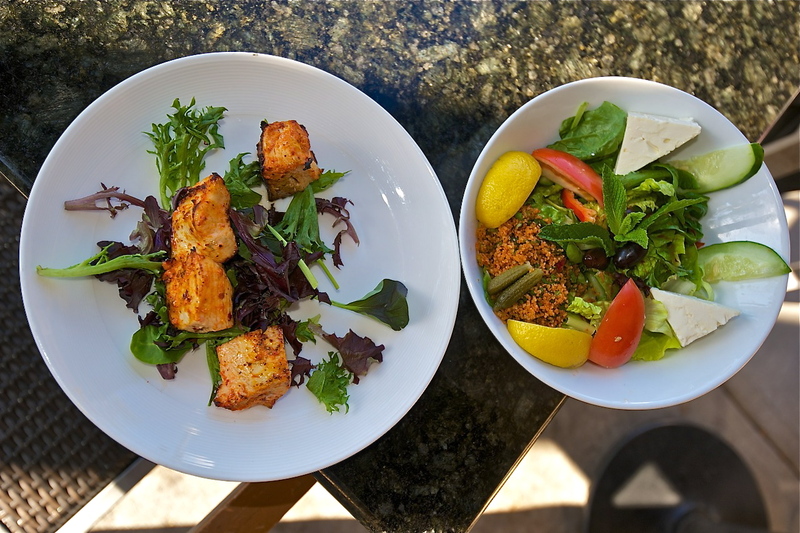 Now, their favorites are part of a creative, healthy list of tasty choices on a menu complete with gluten free and vegan choices. Fragrant aromas and Turkish music fill the air at Bosphorous Turkish Cuisine. The name, which originates from the strait that lies in the center of Istanbul and connects Europe to Asia, serves authentic Turkish cuisine in a welcoming, classy style. Crisp, white table linens, white china, crystal wine glasses greet hungry diners as they delight in tabbuli, lavas, imported feta cheese, and hand chopped chicken seasoned with fresh garlic, light hot peppers, and parsley. Food so flavorful, it lures you in at Bosphorous Turkish Cuisine. Image Credit © Dale Sanders 2014. When a brilliant bowl of popcorn arrives at your table topped with truffle oil, Parmesan cheese, chives and truffle salt, you know something pretty amazing is about to follow. LUMA on Park has that quintessential quality of making diners feel special. From the sweeping entrance, complete with cascading wine cellar, to the luxuriously warm lighting, to food that’s prepared with such care and creativity, you aren’t sure whether to eat it or frame it, LUMA has all the star qualities it takes to shine. Under the direction of Chef Brandon McGlamery, LUMA is dedicated to using artisanal producers, sustainable purveyors, and local and organic farmers whenever possible. A stellar selection of wines by the bottle, glass and ½ glass, offers diners the chance to taste and try a variety of vineyards. Perfect your palate with the house-made infusions, old and new world wines, sipping spirits, or the in-depth reserve menu. Dine in the lap of luxury at Luma on Park. Image Credit © Dale Sanders 2014. 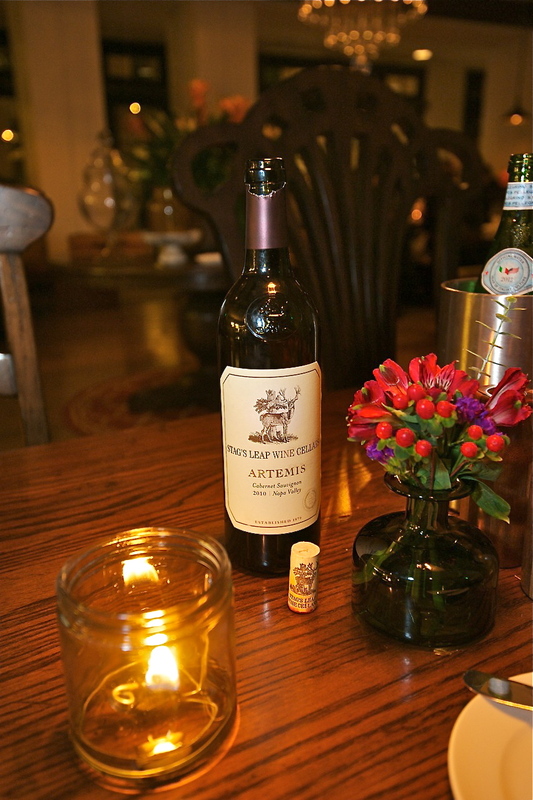 More than 156 hand-selected wines await your palate at The Wine Room.Image Credit © Dale Sanders 2014. The vibe of this creative city beats a little stronger with each passing day as the love of art and design intersect with a passion for food and fashion. Perhaps that was the thought process all along. To create a community that embraced thoughtfulness. Where giving of oneself was the ultimate gift to oneself…in more ways than ever imagined. To read the Luxe Beat Magazine version of this article click on the title Art of the Matter. She’s an Emmy-Award winning writer and producer whose background in journalism led her to discover a talent she’d never known: the ability to strike up random conversations with virtually anyone, anywhere. It’s precisely how she discovered that the waiter taking her order one fall day had just finished driving cross country with a glove and baseball to play catch with as many people as he could. “Why?” So he could write a book about it. Intrigued, she wrote a story about him, and the rest is history. This “knack for chat” would soon become her most notable attribute when interviewing folks for her stories. From CEO’s, and hoteliers, to architects and waiters, singers to skiers, protestors, sports figures, and countless others, she’s run the gamut of story assignments for some of nations premiere publications. Some of her most notable projects have included work for NBC, The Travel Channel and Lifetime Television for Women. She served as contributing writer for The Tampa Tribune, Colorado Homes & Lifestyles Magazine, and 5280: Denver’s Mile High Magazine. During her tenure with a Miami public relations agency, she was the lead writer for such prestigious clients as Bacardi Imports. Her dream assignments came to life when she was featured on the Golf Channel as part of the Florida swing of the PGA Tour and sat in the broadcasters booth during the Phillies Spring Training in Clearwater. A graduate of Stanford University’s Mass Media Institute and University of Miami’s School of Business, Mary Haban is most at home when she’s engaged in great conversation with people she’s never met. Her zest for life and adventure make her one of the most avid NASCAR fans, wannabe scratch golfers and perpetual yogis in search of that perfect pose. Beautiful prose and imagery. We are right there with the writer and photographer.